The 10 Best Cross-Country Skiing Trails in Wisconsin! Enjoy the bitter sweet frigid Wisconsin winter air while traveling on almost 700 miles of their groomed cross-country skiing trails. Not only is it all for fun and games, it’s a great way to stay active during the intense amount of winter months Wisconsin encounters. Kettle Moraine State Forest’s northern unit located in Campbellsport, Wisconsin is one of the largest groomed cross-country ski trails in the state. Their almost 25 miles of groomed trails, an additional 49 miles of un-groomed trails, warming shelters make Campbellsport a hot commodity for cross country ski fanatics. Mirror Lake is a beautiful sight in the summer months but even more picturesque during the winter. Check out their 18 miles of combined skate and classic groomed trails—conveniently placed between the hot tourist town of Wisconsin Dells and Wisconsin’s capitol, Madison. Behold the Northern Highland-American Legion State Forest, which offers over 50 miles of cross-country skiing heaven. An additional 75 miles of un-groomed trails and four other trail systems loops and shelters are put into place. The town of Black River Falls is home to notoriously sought-out snow skiing trails in the Black River State Forest. On top of the 24 miles of groomed trails there is a heated log cabin shelter. Black River State Forest trails are perfect for the entire spectrum of cross-country skiing levels. Located in the Stevens Point area is Green Circle State Trail. Find almost 25 miles of groomed cross-country ski trails around the Plover River. Loops of around six miles allow for a great work out while enjoying the snow. While Red Cedar State Trail is among the smaller on the list, it is a well-designed linear rail trail beginning near the town of Menomonie and ending in Downsville. Those looking to participate on the seven miles of Red Cedar State Trail need a state trail pass. Cross-country skiing is a favorite winter sport at the Richard Bong State Recreational Area. However the trails are not groomed for cross-country skiers making it a great challenge for the advanced in the group. Check out their 16 miles of trails in Kansasville, Wisconsin. Check out the scenic views along Lake Michigan near Two Rivers, WI. 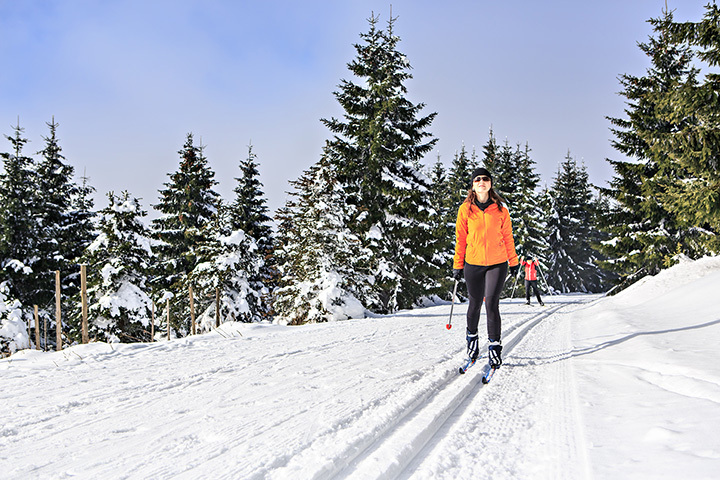 Their 11 miles of classic groomed ski trails and additional one mile of un-groomed trail allow for cross-country ski participants to get creative during their winter activity time. Especially known for its popularity in the summer months in Wisconsin, Brule River State Forest offers great cross-country ski trails. Various loops and different terrains allow for both advanced and beginners to find comfort in their skill set. Located in Wisconsin’s drift-less area gives the Cadiz Springs State Recreational Area a different terrain for winter sports like cross-country skiing. Their moderately large trails are un-groomed but offer key features like forested areas and flat lands along the areas lakes. View more Wisconsin Cross Country Skiing Trails.